Heavy Duty 500lb Maximum Weight Capacity. 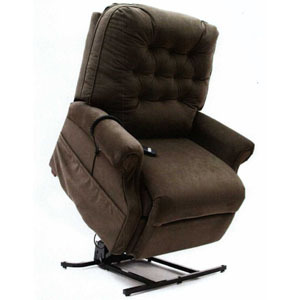 Easy Comfort 3 Position Chair Lounger. 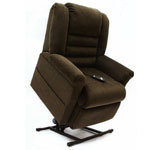 The Easy Comfort Chaise lounger is great for watching TV, sleeping, reading or simply relaxing. 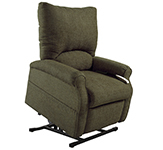 With the push of a button, the LC-500 Easy Comfort Lift Chair will smoothly and safely lift you up for an easy exit. 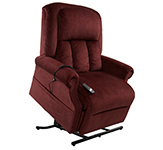 The Easy Comfort LC-500 delivers a superb value, great comfort and exceptional quality. Features smooth and quiet operation in a stylish design. 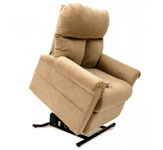 The Easy Comfort LC-500 Lift Chair from Mega Motion is available in Evergreen, Java, Linen, Old Navy and Vino Fabric. 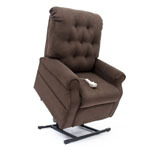 Counter-balanced recliner mechanism offers Quiet and Smooth Lift System Operation. Four durable, easily adjustable steel leg levelers provide stability and easy adjustment. Durable 500 lb maximum weight capacity. Extra long spring suspension system is used in seats and backs for deep, cradling comfort and improved weight distribution. 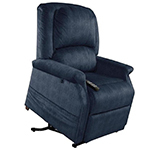 *WARRANTY INFORMATION: New LC-500 Easy Comfort Lift Chair Recliner by Mega Motion have a Lifetime/4/1 Year Factory Limited Warranty for USA orders only. No warranty outside the USA. The Mega Motion Lift Chairs include a manufacturer's lifetime lift mechanism warranty against Structural defects (Frame only - cosmetics are not covered). Parts are covered for four years from the original date of purchase. In Home Factory Service is covered for one year from the date of purchase and can be extended with an extended warranty.